The basketball team began its conference slate on Saturday, January 3 with an 83-76 loss in double overtime to the Notre Dame Fighting Irish in South Bend, Indiana. It was Tech’s first double overtime game in four years, and its fourth loss in such games in a row. Marcus Georges-Hunt led the team with 20 points, his fifth-straight double digit game, while Charles Mitchell and Chris Bolden each contributed 14 points. The Jackets took a 10 point lead over the Irish just three minutes into the game thanks to three straight three pointers by Bolden and Georges-Hunt. Notre Dame chipped away at that lead throughout the first half, but going into halftime the Jackets were up 31-27. The Irish outscored the Jackets in the paint, but Tech’s two second-chance field goals and 12 point contribution from the bench gave them the halftime lead. The Fighting Irish continued to rally in the second half, slowly outscoring the Jackets before taking their first lead in the game with just nine minutes to go in regulation. Notre Dame’s Steve Vasturia came alive in the second half after being held scoreless in the first, contributing 11 points in the half and ending the game with 17. The Jackets trailed by four points with just three minutes to go but remained opportunistic on both sides of the court. Offensive and defensive rebounds by Mitchell and Robert Sampson kept the Jackets in the game and allowed them to tie the score at 59. 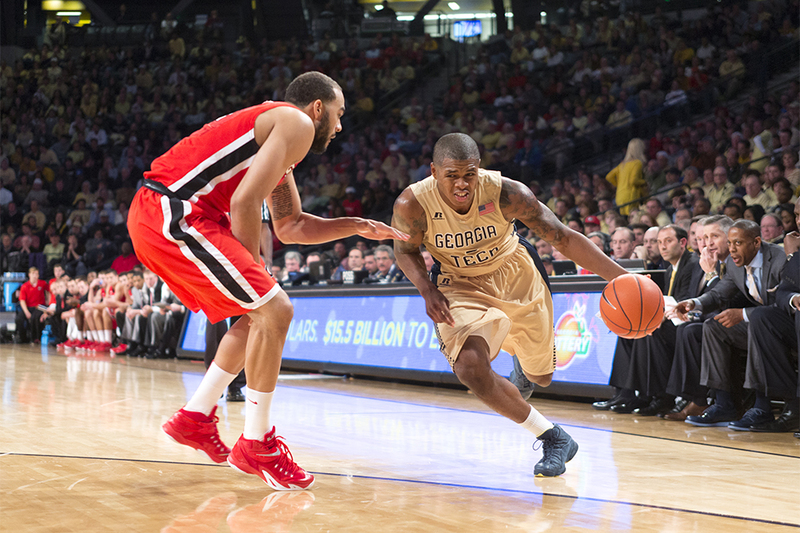 Tech had the chance to win it in regulation, but Georges-Hunt had the ball stripped on a layup attempt at the buzzer. The Irish quickly jumped to a six point lead in the first overtime via two three pointers and a dunk. A series of missed free throws by Notre Dame gave the Jackets a chance to tie the game late, and they capitalized with a tip-in by Demarco Cox. Strong defense by the Jackets in the final 10 seconds of the period sent the game to a second overtime. The Irish came out fighting to begin the second overtime while the Jackets were unable to sustain any offensive rhythm. Tech missed its shots while Notre Dame converted its own, and the Irish were up by seven with two minutes to go. One Tech possession in the final minute saw three missed jumpers followed by three offensive rebounds before a blocked layup attempt gave the ball back to the Irish, and the Jackets fell 83-76. Irish guard Pat Connaughton scored five of his team’s 14 points and contributed on defense in the second overtime, tallying two rebounds, a block and a steal. The Jackets out-rebounded Notre Dame 46-31 and as a result nearly doubled the Irish’s second chance points, 17-9. The team also stole the ball 11 times compared to Notre Dame’s six, but did not block a shot for the first time all season. Bolden saw some positives in his team despite the loss. The Jackets faced off against Syracuse this past Wednesday and lost 46-45. Tech moved to 9-5 overall and 0-2 in ACC play . Tech will play at Wake Forest on Saturday, January 10, before a rematch with the Fighting Irish on Wednesday, January 14 at the McCamish Pavilion. Tech won last year 86-80 at Wake Forest and will be looking for a similar result this weekend.